Is there a singular purpose behind everything that God does in history? Did this same purpose also motivate the human authors of Scripture? Jim Hamilton would answer ‘yes’ to these questions, and believes the purpose to be God’s Glory in Salvation Through Judgment, hence the title of this book. God means to reveal himself in an astonishing display of his mercy and justice, with the justice highlighting the mercy. Basically, Hamilton argues that God’s glory is revealed in salvation being given in the context of judgment. In this book he pursues this thesis by examining the Biblical books in order, with a final chapter responding to criticisms of his thesis. Taking a canonical approach, each larger Biblical section (Torah, Prophets, etc.) is introduced before addressing each book within the set, summarizing its message and showing how it fits in the canon. Next comes a summary of main concepts and themes, outlines of narrative structures, and a commentary through the broad sections of text. This book particularly shines when examining the literary structure of each book. Hamilton sifts through contemporary scholarship and lets the reader reap the benefits, carefully tracing the flow of each book and drawing attention to connections throughout Scripture; many of which were profound and completely new to me. It is refreshing to see the whole Bible put together rather than pulled apart, as in much of scholarship today. The many diagrams and tables are worth the price of the book alone. Some of these include the many Old Testament allusions to Exodus 34:6-7, a list of prayers that appeal to God’s concern for His own glory, all mentions of Baptism in the New Testament, uses of “in Christ” in Colossians, etc. It is enormously helpful to have all this information in one accessible place. Apart from drawing attention to allusions to Exodus 34:6-7 throughout Scripture, it is a pity that Hamilton doesn’t really show if and how the theme of salvation through judgment develops. This would have been a very interesting element that is missed. Considering the purposes of this book, Hamilton’s writing and insights are surprisingly clear and at many times devotional. His love for the Lord and His Word clearly shines through; this is no dry theological exercise. Hamilton clearly wants us to be enthralled with God’s glory as he himself is. Hamilton argues passionately and persuasively, and though some will hesitate in deeming it ‘the centre’ of the Bible, God’s glory in salvation through judgment is easily established as central. This is clearly seen in the very focal point of our faith: we saved through Christ receiving our judgement, all to the Glory of God. First, Hamilton believes that each Biblical writer consciously pursues this thesis at all times (loc. 13041), but some books (such as Song of Songs and Ruth) don’t persuasively fit this expectation. Here he seems to make things harder for himself than needed; if instead, Hamilton argued the thesis as central to the storyline of the Bible, then like a jigsaw puzzle, even the odd-looking pieces could be shown to fit the beautiful picture of God’s glory in salvation through judgment. Second, to make his thesis work in certain contexts, the terms salvation and judgment become slightly amorphous. When Hamilton uses these words throughout the book, readers are often left to discern for themselves which shade of meaning he is employing. For example, Paul’s correction of the Corinthians regarding the resurrection (1 Cor 15) is summarized thus by Hamilton, “Paul condemns their mistaken perspective, and through that judgment he means to bring them to salvation for God’s glory” (loc 10633). Here ‘judgment’ seems to mean correction, but what kind of salvation is in view? By receiving Paul’s correction, are the Corinthians obtaining redemption, some kind of spiritual protection, or something else? It just seems a little forced to me. In both cases, it appears to me that Hamilton overreaches unnecessarily at times, which undermines his rhetorical power in proving his thesis. I’ve only given these perceived weaknesses attention since they are central to Hamilton’s thesis and the purpose of the book. However, the sheer quality of content outweighs these weaknesses. It’s hard to criticize a book that aims for the moon, but despite falling short, still reaching higher than most others. The depths of insights in this book are too vast to share in this review. 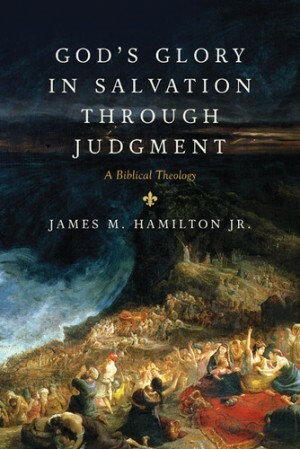 God’s Glory in Salvation Through Judgment would be a wonderful resource when studying or teaching through a Bible book, particularly because of the literary flow and the tables and charts that Hamilton provides. Perhaps surprisingly, this book would be equally excellent to supplement personal (‘devotional’) Bible reading. This book really came to life when I started reading it slowly and regularly alongside my morning Bible reading. I read a portion of the Bible, and then Hamilton’s comments on that section; this was a rich time of seeing new things in the Scripture that I had started sooner! That being the case, I would recommend this book not only to pastors/teachers but also any readers of the Word. As mentioned above, Hamilton’s clear writing allows any to reach the fruits of his work. Whether one takes Hamilton’s thesis as ‘the centre’ or merely ‘central’, it is a theme that many Christians neglect to see; thankfully this book seeks to set this right. I remember my vision of God being exponentially transformed by reading Johnathan Edwards’ The End for Which God Created the World, and I believe Hamilton’s book will have the same effect on others. Watch: A discussion with Hamilton and fellow professors at SBTS and authors of Kingdom Through Covenant on Biblical Theology and their respective books.